Most of Anthropologie's merchandise does have an original, one-of-a-kind feel to it, which can occasionally help a person (that'd be me) justify the price tag. 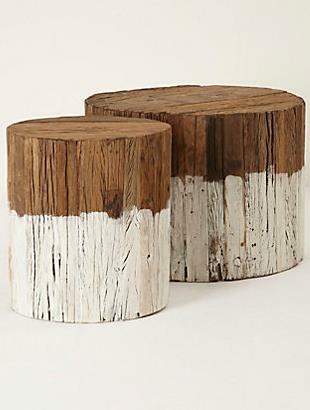 But despite my mild to moderate obsession, even I couldn't help but roll my eyes (only a little bit, I swear dearest Anthropologie, and I promise it won't happen again if you'll let me live there) at these stump tables for $298-$398. I half roll my eyes not because I don't love them, I do, of course, but because I believe this might actually be something I'm capable of making myself and for a LOT less than 300 dollars-ish! Finding the stump may actually be the hardest part of this project. Believe it or not I actually had these stumps from some trees we cut down. They were well aged and had already lost their bark. If your's have bark, let them age for a couple of months in a warm, dry location such as an attic for a couple of months and then the bark will be much easier to scrape off. Since my logs were fairly heavy, I purchased some swivel casters and screwed to the bottom. To level the logs I used a cut up paint stick as shims under the casters before screwing down. Next, just paint along the bottom. Taping isn't necessary as it's meant to look "dipped". Any paint color will work, I stuck with tonal hues...a cream and a pale gray. Finally I used a satin polyurethane above the paint line and on the top. I chose not to poly over the paint because I like the contrast of the matte paint and the satin wood. If you've read my blog before you also know that I am already decorating for my someday-screened porch. These are great in my living room for now, but they will look even better on my screened porch. To see more of my someday-screened porch projects check out this West Elm inspired woven lampshade!